Abraham Lincoln said that the logic and power of Garrison and the antislavery people... and the army have done it all. Garrison, a pacifist, hoped -- and believed until shortly before the Civil War started -- that the goal could be accomplished without an army. He perhaps underestimated the unwillingness of slaveholders to give up the money, land, and power over other human beings that slavery gave them, as well as the reluctance of many politicians and others to oppose them. Although he may not have fully understood why one person would enslave another, Garrison knew it was wrong and devoted more than 35 years, most of his adult life, to fighting it. Mayers book is the saga of that life. His nearly 10 years of researching and writing it were well-spent indeed. In fact, Henry David Thoreau rather belatedly came to the fore in the antislavery movement. In 1854 when an escaped slave, Anthony Burns, was returned to his owner from Boston, against the wishes of much of the populace, Thoreau was incensed and wrote accordingly. William Lloyd Garrison was born in Newburyport into a family that would be more unusual now than it was in 1805. His maternal grandparents had arrived in the Maritime Provinces of Canada as servants indentured to the ship captain, evidently just for the voyage. He married and released them, and within 10 years grandfather Lloyd was master of his own ship. Garrisons grandmother had 13 children, of whom Frances was the beauty. She was also tall, strong, capable, and an avid reader. Frances was deeply affected by one of an influx of evangelistic preachers which had begun in her childhood, and she early became an enthusiastic convert, causing her parents to send her to her grandparents. She taught school and preached, a powerful speaker who attracted not only the faithful but the restless sparks of the neighborhood. One of these was Abijah Garrison. After attaining success as a sea pilot, Abijah married Frances in 1798. Several moves and the births of James in 1801 and Caroline in 1803 followed. Under the Seamans Protection act, Abijah had obtained American papers and moved his family in 1805 to booming Newburyport, where in the home of Baptist minister Martha Farnham, William Lloyd was born. When in 1807, Farmer Jefferson embargoed all trade with Europe, the mainstay of the Northeast Coast, Abijahs business failed. Caroline died from eating a poisonous spring plant at age 5, and Abijah took to drink. Subsequently he either left home or was thrown out and never heard from again. After that Frances called herself Maria and her younger son Lloyd. She found occasional work taking care of new mothers and their babies, but her little boys still had to sell clams they had dug and fetch soup from the Mariners Relief Kitchen. In 1811, central Newburyport was almost destroyed by fire, and the next year the country was at war with England. Maria took James and moved to Lynn in 1814, hoping to get more work. Lloyd was devastated when he and his younger sister Elizabeth were left behind. When Lloyd was eight his mother permitted Martha to board him out with a couple named Bartlett, who were like the humble grandparents in a fairly tale. After he had to leave school to help Uncle Bartlett, Maria let him move to Lynn and apprenticed him to a shoemaker. He was too small to do the work without great pain but persevered until another job was found. In 1815 they moved to Baltimore. James, who had lost jobs in both cities due to drinking, disappeared not long after -- for about 14 years as it turned out. Maria did find good employment in Baltimore, but in a year and a half Lloyd had become so unhappy at her not being home, and perhaps tired of walking to the Baptist Church three times every Sunday, he returned to the Bartletts and school. He was now 11 and the next year was apprenticed to Ephraim Allen, editor of the Herald, as a printers devil, a horrible job. Determined, he did it so well, Allen asked him to remain after a year and begin learning the challenging work of making up a newspaper. Thus his first career was launched. Allen also took Lloyd into his comfortable home, graced with children, including a boy his own age, and books. At last he could read Shakespeare, Milton, and Scott, and sing the songs of Moore and Burns. When he decided to become a writer, his mother was not pleased, fearing he would starve in a garret, and worse, lose his piety. He saw her only once more before she died in 1823. One thing she wrote him that must have stuck, however, was to remember Henny, a black woman who had taken good care of her. By the age of 18 Garrison was popular, known for extravagantly genteel manners, also punning and reciting poetry, mostly his own. MLord Garrulous also started a debating club and was asked to give their July Fourth address in 1824. Instead of repeating the American story, he spoke of the several independence movements in Europe and Latin America at the time, concluding with words of Byron. His friends were so impressed, they raised funds to have it published at the Herald, by himself. Two years later, Garrison borrowed money from Allen to buy a little paper from his friend, Isaac Knapp. He called it the Free Press and wrote 25 column inches a week of editorial with more flair than his mentor and indulging...humorous turns. He published poetry, including some by a W. Haverhill, who turned out to be a shy Quaker shoemaker whose sister had found the poems and posted them to the paper. He was John Greenleaf Whittier and they became close friends. Mayer writes that although friends treasured his sweet temper and sympathetic understanding, Garrison deliberately created the editorial personality of a tiger. And imbued with a strong sense of morality from the Farnham family as well as from his mother, when he smoked out a shady political plot in which Allen was involved, he took him to task in the Free Press. In six months he sold the paper probably because Allen called in his loan, but the editor never admitted that. The one religious group that had consistently fought slavery from its beginning was the Society of Friends, or Quakers. When Quaker Benjamin Lundy came to Colliers, he had travelled 12,000 miles in 19 states and had persuaded a number of holders to free their slaves. Seeking funds to continue his work, which included a little newspaper in Baltimore, Lundy went on to the suburbs and south to New Bedford and Fall River where collections were good. Garrison resigned from Colliers paper at the end of his six-month contract and subsequently took on a political task for Republicans in Vermont, plumping for the re-election of John Quincy Adams against Andrew Jackson, a slaveholder. He did his partisan work with flair and humor, and editorialized on temperance, pacifism, practical education, and antislavery. He also started a petition to abolish slavery in Washington, D.C. and got 2300 signatures. In the Vermont newspaper, Garrison also wrote passionate poetry dedicated to a young Boston lady. Their relationship did not work out, perhaps because she did not like being wooed by newspaper. Again he resigned in six months and returned to Boston. In 1829 Garrison was invited to speak on the Fourth of July at Park St. Church by the American Colonization Society, which wanted to repatriate slaves to Africa. They had no idea this was not what Garrison had in mind. He opened by attacking the day itself and declared that the shameful toleration of the crime of slaveholding ought to spike every cannon and haul down every banner in the holiday salute. ...He argued further that the great majority of the slave population was American-born and entitled to all the privileges of citizenship, while their children possess the same inherent and inalienable rights as ours. Only Whittier, then editor of Colliers paper, printed the entire text, recognizing that his friend had rewritten the Declaration of Independence. Ten days later Garrison, with a clergyman who had been invited to speak, attended the annual celebration of the black community, sponsored by their politically assertive Masonic Lodge. He sent his account to Lundys newspaper. Except for his mothers pleas to remember Henny, Mayer found nothing else to explain Garrisons emotional connection to that community but feels it cannot have been just abstract thought, that perhaps he had been educated on the margins of the color line in 1820s Boston. This might be, but it occurs to me that his education could have begun in Baltimore in his youth. Inevitably Garrison was arrested for libel after writing the truth about slave-trading in the city, involving a Newburyport shipper. He lost the case and, unable to pay the fine, was given six months. Youthful offenders were being kept in the home of new warden Hudson at the time, and although Garrison was 24, Hudson and his wife took one look at the sweet-faced scold and invited him in. He again had a family -- for only 49 days. When a New York philanthropist, Arthur Tappan, read a pamphlet Lundy had written about Garrisons plight, he offered to pay the $100 fine. Back in Boston, Garrison conferred with leaders of the black community and got the help of their two ministers, Rev. Thomas Paul and Rev. Samuel Snowden, hairdresser James Barbadoes, and a committee of women who began to raise some money. In partnership with Isaac Knapp, and with a contribution for 27 subscriptions from Philadelphia black leader James Forten, the first issue of The Liberator was published on January 1, 1831. Garrison had turned 25 a few days earlier. The Liberator was published every week for 35 eventful years. And in January of 1832, Garrison brought friends to the African Meeting House on Belknap (now Joy) St. to form the New England Anti-Slavery Society. Women came into the movement of course and Garrison readily joined their fight for equal rights. When escaped-slave Frederick Douglass came to Boston, Garrison published his life story and make him an agent of the Anti-Slavery Society. 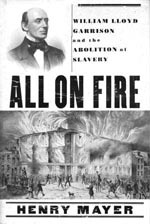 Garrison was nearly lynched in Boston on one occasion; in Philadelphia, a handsome new building in which a meeting was to be held, was set on fire by rowdies and burned to the ground; and after escaped slave Mr. Burns was captured in 1854, Garrison burned a copy of the Constitution at the Fourth of July gathering. Some important people got angry at him and took up the cause their own way; many of them came back to his way of thinking that slavery had to be ended all at once. Garrison married a fine woman, Helen Benson, in 1834, and after her children were sufficiently grown, she became active in the womens movement as well as in that of antislavery. They were devoted, nurturing parents to seven children, five of whom lived to maturity. Their eldest, George, went to war with the 55th Massachusetts and stood by his father in uniform when the U.S. flag was raised again at Fort Sumter. All five were active in civil rights all their lives. I usually do not retell any significant part of a story, or history, that an author has told so well, but I felt compelled to describe the early life of and influences on this remarkable sweet-faced scold who accomplished so much. There is, of course, a great deal more to this outstanding biography of William Lloyd Garrison. The 19th Century was in many respects as tumultuous as the 20th has been. And the question of slavery, pro or con, was involved in nearly every event. There were many heroes and heroines, quite a number of villains, and a few who managed to be both. Henry Mayer gives us a close look at all of them and writes superbly.